15 · 2h 5m · 2019. Action · Adventure · Crime · Drama · Thriller. Adria Arjona · Ben Affleck · Charlie Hunnam · Garrett Hedlund · Oscar Isaac · Pedro Pascal. J.C. Chandor (screenplay) · Mark Boal (screenplay and story). After finally hanging up the Batman cowl, Ben Affleck's next film is far less fantastical. Having a more grounded tone, Triple Frontier has no masked vigilantes or alien invasions, and is very much set in the real world. Directed by J. C. Chandor, this is an action thriller and has its worldwide release as a Netflix Original. Alongside Affleck is Oscar Isaac, Charlie Hunnam, Garrett Hedlund and Pedro Pascal as five former Special Ops soldiers. Fed up of having nothing to show for their years of service, they decide to use their deadly skills for their own benefit. Deep in the Amazon jungle is Cartel boss Gabriel Lorea (Reynaldo Gallegos), hiding with a huge fortune of cash, which the five comrades plan to steal for themselves. As always, nothing goes to plan, and they soon find themselves in over their heads. Similar to his previous films, Chandor's focus is on characterisation over plot. In that regard, Triple Frontier is driven by its protagonists. Their motivations for doing the things they do is what primarily propels the story. The heist itself is something we've seen play out in a number of different scenarios. There are no real surprises, and all the story beats will feel very familiar. It's through the characters however where the film succeeds. Although tropes in their own right, they are still well-drawn out, and you understand where most of them are coming from and what motivates them. Giving them nuance and complexity, they're full of shades of grey in their morality. We see this especially through Affleck's Captain Davis and Isaac's Garcia, who both bring strong performances. Like a lot of soldiers, Davis struggles in civilian life. He doesn't want to go back into that line of work, but at the same time knows that's what he's truly good at. Affleck straddles those two aspects of Davis aptly. Despite what they’re about to do is illegal, he's still able to come off sympathetic and relatable. To the same degree, Isaac does a solid job as the instigator of the heist. Great at bringing a steely intensity, you understand why he wants to do this and how he's able to get the others on board. Hunnam, Hedlund and Pascal, don't get as much to do, but they are good with the script they're given. All five actors shine mostly when their together, deftly playing off each other, they portray a believable unit of comrades-in-arms who really do look like they've known each for years. On top of that, they add a convincing performance when it comes to the military action. The only let down ultimately is Gallegos' antagonist, who is purely a plot device and serves no other function than to move the five protagonists forward in the narrative. Going with these rough and well-worn characters is an appropriately gritty tone. There's no banter or an abundance of playfulness like other heist movies. No stylish cinematography or cool-sounding soundtrack. This is a dangerous crime these people are about to commit against some powerful drug lords. Chandor plays it straight throughout, and when the mission eventually goes south, he shows the brutal and bloody consequences. Not just to the threat of life, but also the toll it takes on the team’s friendship. When it does come to the action, these are grounded, strategic and army based sequences. Making it realistic as possible, this is no Michael Bay or John Woo film. There's no glamorising of the violence with slow motion and balletic gun fights. Well shot and intense, these set pieces are more about showing us the reality of ground-level warfare. Where every second counts and it’s about stealth instead of running in guns blazing. Chandor makes sure we feel every death and it's never treated in a flippant manner. Every decision these soldiers make to kill is never made lightly, and we're shown the cost of taking life, regardless of whether they deserved it or not. Triple Frontier may not be breaking any new ground, but it is an efficient and watchable action thriller nonetheless. Thanks largely to the leads chemistry and commitment, this is a film that has something to say, and is not solely entertainment. 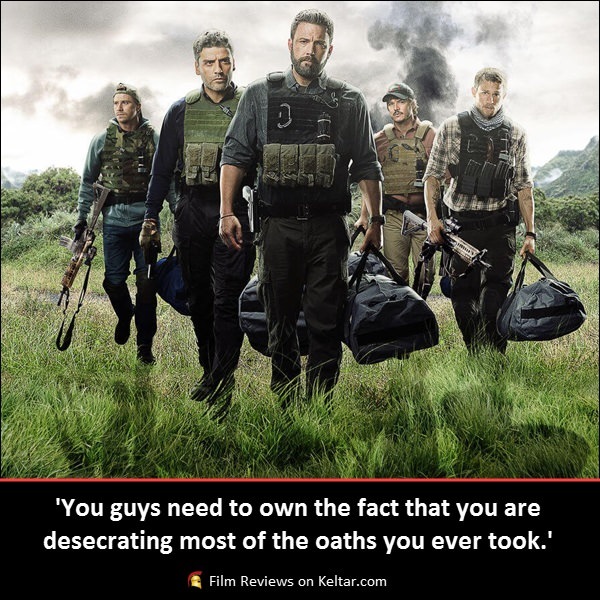 Likewise, keeping it engaging are the gripping action sequences that pull no punches, showing the true nature of comradery, and the dangers of greed. 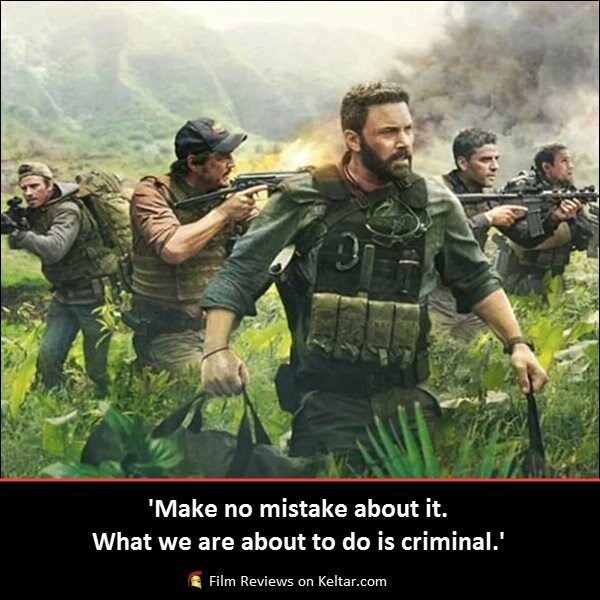 Five Special Forces soldiers fed up with a lack of recognition and money for their years of service, reunite to rob a drug lord of his money. Review by David Axcell. This article is copyright owned by Keltar Limited. All rights reserved. Plagiarism or unauthorised copying is not permitted. All other copyrights remain the property of their respective owners. Posters, images and quotes credit: Triple Frontier (2019) production and distribution companies. Trailer credit: Netflix – YouTube.